Data log graph illustrating the recharge characteristics of the National Luna 5Amp Intelligent Charger applied to a 105 A/H deep-cycle battery after it was subjected to a 70 % depth of discharge; i.e. 73.5 A/H was removed from the battery and then recharged over a 24-hour period. A recent survey revealed that most people with a dual-battery system in their vehicle believe that driving for a few hours will restore power to their auxiliary battery. It seems many people think that the long drive home will be more than enough to top up power. All batteries need time to recharge. There are no short cuts or special systems that can make the recharge process any faster than the battery can handle. In most cases, a DC-DC dual-battery system can even slow down the recharge rate within the first few hours of driving. If left unattended, a partially discharged battery will start to degrade, thereby reducing its lifespan. Similarly, a fully recharged battery cannot store energy indefinitely. It will discharge slowly over time. All batteries require a maintenance charge to ensure maximum performance and life. This can be achieved using an intelligent maintenance charger. You might be wondering if the term “maintenance charger” somehow relates to a “trickle charger”. This is a bit of a grey area because most conventional trickle chargers cause more damage to a battery than good. Many of us are familiar with – and perhaps even own – a low-cost 220 V battery charger, commonly sold by automotive stores. What you might not know is that these chargers are not self-regulating and don’t have the required charge stages. National Luna recently launched a self-regulating intelligent charger that will automatically diagnose, recover and charge all lead-acid battery types, including flooded (wet cell), MF, VRLA, AGM, GEL and calcium batteries. Best of all, the charger can be permanently connected to your battery and you never need to worry about it! Diagnosis. The unique diagnostic function checks the status of the battery and determines if it can accept a charge. Recovery. 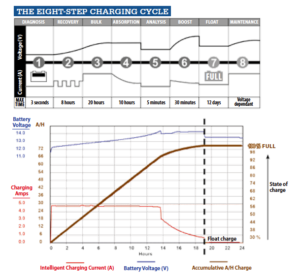 This soft-start stage pulses the output energy, making sure the battery is in a state to accept the full-charge current. Bulk. 80 % of the battery’s energy is returned in this phase, using maximum current output. Absorption. The charging current drops off slowly as the battery reaches full capacity. Voltage is carefully regulated at this stage. This highlights a major difference between regulated and non-regulated chargers. Analysis. The charger once again checks the status of the battery and determines whether or not it’s retaining energy. Boost. This feature is used to recover some battery types – like a deep-cycle calcium battery – in order to restore maximum capacity. Float. Once the battery is fully charged, the charge voltage is reduced to prevent overcharging. Maintenance charge. The charger continuously monitors the terminal voltage in order to determine if a maintenance charge should be initiated. If the voltage drops due to self-discharging (or a load), the charger re-applies current to keep the battery full. The charger features a five-year guarantee and retails for R1 595 at all leading outdoor and 4×4 stores. The kit includes battery clamps, a quick-connect coupler and a fused cable for more permanent installation. View more info here!